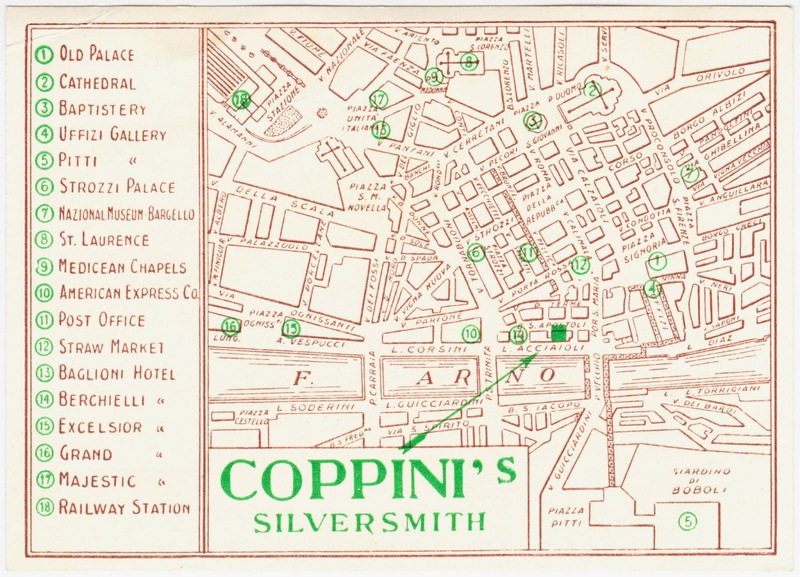 This undated old advertising card, which is 4½ inches wide, includes a map to help you find Coppini's Silversmith in Florence, Italy (Firenze). "Know-how and craftsmanship, research and contemporary design. Fratelli Coppini has been a benchmark of excellence in fine jewellery and precious stones in Florence since 1740. The company began as a silversmith's workshop and then made its entry into the watchmaking and jewellery world by designing one-of-the-kind pieces. The creations by Fratelli Coppini are designed in the workshop by Benedetta and handcrafted by artisans of the highest skill. Ongoing research and careful selection of precious stones, creativity and insight are the key to the success of Fratelli Coppini, which now ranks as an equal among the greatest names of Italian high jewellery, such as Chantecler and Pippo Perez." One older example of their work, a silver folding travel spoon, is for sale at Ruby Lane for $165. The map also makes reference to Florence locations such as Old Palace (Palazzo Vecchio), Uffizi Gallery, Pitti Gallery, Strozzi Palace, Nazional Museum Bargello and more.